Happy Flashback Friday St. Louis! This is a Bi-State bus with the groovy old color scheme heading east on Forsyth crossing Central in downtown Clayton in 1981. The white building behind the bus now houses Chipotle. HINT: A building in this photo currently serves as the corporate headquarters for Graybar, a leading distributor of high-quality electrical, communications and data networking products. I worked for a few years in the red building for Wells Fargo. 7911 Forsyth Ave. in Clayton. I will guess 1996 for the year. Very cool John. The year this photo was shot was 1981. 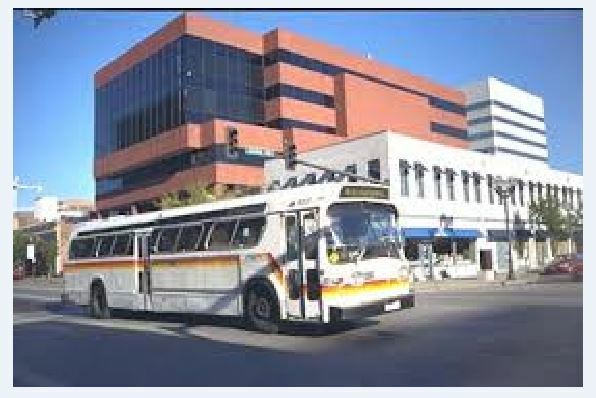 That would be my guess too – Forsyth and Central in Clayton in the 1990’s as I thought those were the livery colors when Metrolink debuted. James, good guess, but actually a little earlier — 1981. In Clayton, eastbound Forsyth at Central. Your back is facing the County Gov’t Center. Late 80’s – early 90’s. The white corner we see (when I was up there) had Taco Bell, then to them was a Kinkos. Now I think BreadCo moved up there from Carondelet) Also on that corner was a fancy McDonald’s (now a Starbucks).And of course, the one and only World News to finish out the corner. Don, wow, you sure know the area. This photo was taken in 1981. I don’t think that 1981 is correct. That is an 83 bus series which is the year the bus was manufactured. So if the bus came out in 83 how could the photo be in 81? I believe the photo is early 90s. The bus in the picture is an 83 series which means the bus was manufactured in 1983. I would guess that picture is in the early 90s and definitely not 1981.